​The Hello Josephines are a contagiously fun act that performs a unique blend of funky jazz, R&B, and Americana. The band features the instrumental and vocal talents of Bess Jacques, Kate Campbell Strauss, Per Hanson, and Scott Morrison on originals and covers with lush vocal harmonies, playful solos, and pulsing grooves that move audiences in the Portland area and beyond. 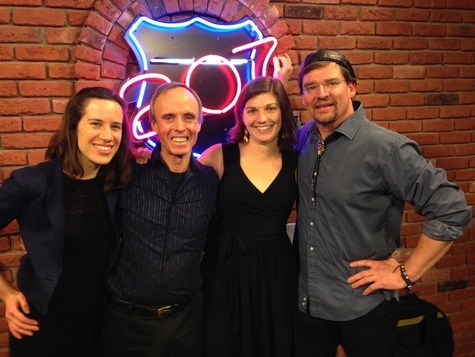 The Hello Josephines have been featured on WCSH’s 207 show and work regularly at clubs and parties throughout Maine. You can hear The Hello Josephines on the first Wednesday of every month at The Frog & Turtle, 7pm-closing. ​Pianist and vocalist Bess Jacques left behind a career in computer sciences to return to her home state of Maine in 2014 as a full-time musician. While piano and voice are her native instruments, she also plays fiddle (picked up while living abroad in Ireland on a music fellowship) and once played accordion in a tango band. 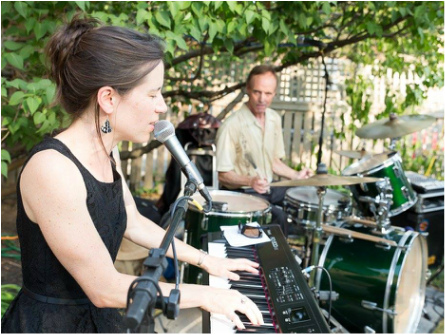 Having won various awards over the years for performance and musicianship, Bess is drawn to music of many styles, from classical and jazz to folk and funk, and she loves combining these elements in her compositions, arrangements, and improvisations. She plays out regularly in the greater Portland area and also teaches piano to children and adults from her studio in Westbrook. ​Kate Campbell Strauss’s devotion to the saxophone began when she heard Sonny Rollins perform near her hometown of Shutesbury, MA at the age of 8. Kate’s musical family introduced her to tunes by the jazz greats and encouraged her to explore jazz on her own and through lessons. 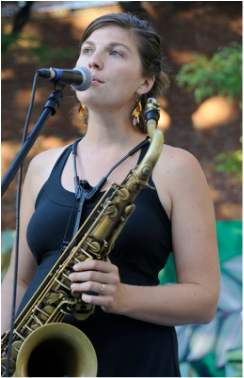 Drawn to the expressive freedom that she found in jazz, Kate studied formally with free jazz innovator Bobby Bradford at Pomona College, various jazz luminaries at UMass Amherst’s Jazz in July, and informally with mentors at summer camp. She is an integral part of the Southern Maine music scene, both as a founder of several groups, as a freelance musician in a variety of local bands, as a private teacher and as a radio host on WMPG. Whatever the genre, Kate’s playing reflects her passion for musical interplay and authentic expression. ​Drummer Per Hanson is a long-standing New England music icon, revered by musicians and audiences alike. 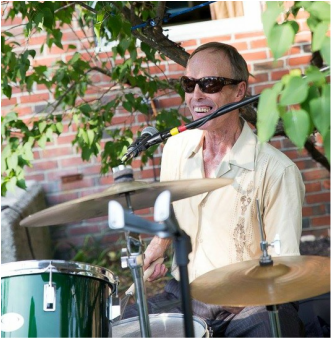 While most widely recognized for his blues drumming, Per enjoys playing many styles, including R&B, country and jazz. He spent many years on the road and in recording studios as a founding member of Ronnie Earl & The Broadcasters, with James Cotton, with David Maxwell, and too many other greats to name here without embarrassing Per, whose endearing humility belies his larger-than-life musical presence and command. Per has recently re-established himself in his hometown of Portland where he remains a fixture of the local music scene, playing out regularly as one of the area’s most sought-after drummers and all-around nice guys. 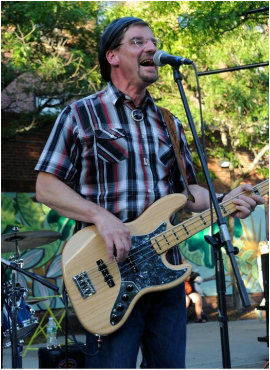 Bassist Scott Morrison brings a soulful, funky sound and style with influences ranging from James Jamerson to Willie Dixon, from George Porter to Flea. Scott cut his teeth in the Boston-based blues/R&B scene of the mid-1980s, sharing the stage and backing local, regional and national acts including Watermelon Slim, Earring George Mayweather, Shirley Lewis, Tom Hambridge, Stovall Brown, Madeleine Hall and Sax Gordon Beadle. Scott moved to Maine in 2002 and raised his family here before reigniting his musical fire. He currently fronts the local Maine band, Downeast Soul Coalition, a high-energy funk/R&B quintet, and freelances with various other local acts. Scott's blues, R&B, and funk influences contribute pulse, grit and groove to The Hello Josephines’ song selection. His passion for improvisation and collaboration and his comfort with boundary breaking arrangements are an ideal fit for this musically diverse project.